Actually, it looks a lot like a fresh 67P/Churyumov-Gerasimenko. A remarkable achievement, only sad such missions get the scraps while the worthless ISS and global warming studies get the lion's share of NASA's money. still can't get close enough shove your snouts into the NASA budget trough? Before the strumpet crime family finishes stealing all the funding? Why are these comments so nasty? Can we just stick to science? We tried that. They don't. They hate science and troll anyone who keeps it. Alas, those days are long gone. Yup... adapt with the times here on the forum, i must say i truly am enjoying exposing the grunts and trolls, antisciencegorilla and his numerous socks rarely misses an opportunity to make himself look like a fool lol..
Just to enlighten you, the person you responded to with this comment is the same guy 3 comments under you claiming to be exposing trolls, hilariously he is one of the worst here. And the guy who claimed he tried to stick to science who posted right under you has about as much scientific understanding as a fry cook. Run away from this place, save yourself. You never answered my question about how there could be two peak energies in the CMB based on wavelength vs. frequency. What am I missing? Playing my high-wire act with you cosmic brainiacs is not easy, but have yet to break my neck! Biochemistry has its limits for me now. Be kind enough to humor me at least. "Precise measurements of the CMB are critical to cosmology, since any proposed model of the universe must explain this radiation. The CMB has a thermal black body spectrum at a temperature of 2.72548±0.00057 K. The spectral radiance dEν/dν peaks at 160.23 GHz, in the microwave range of frequencies, corresponding to a photon energy of about 6.626 × 10−4 eV. Alternatively, if spectral radiance is defined as dEλ/dλ, then the peak wavelength is 1.063 mm (282 GHz, 1.168 x 10−3 eV photons)." I believe this is a 2-fold variance. Big difference in many sciences, perhaps not here. "You never answered my question about how there could be two peak energies in the CMB based on wavelength vs. frequency. What am I missing?" Sorry I am not the guy you asked, but wavelength is the distance between peaks whereas the frequency is the number of peaks per second in an EM wave. Crypt, you walked right into a family thanksgiving dinner. With the drunks screaming invective & flung dishes smashed against the walls! a_p & DS are correct except for one small point. The moderators have to be paid to shovel this crap. Limited ROI results in choosing between higher salaries for the executives? Perhaps it is a little more complicated than that? It is my inconsiderate opinion that this site, phys.org, is actually a front. Providing a forum to be monitored by grad students in the Social Sciences & Mental Health fields. It is hilarious to contemplate, how much the trolls who hate the Social Sciences & Mental Health professions. Perhaps fear more than hate? As the troll commentaries have provided generations of students with thesis material. What a bunch of boneheads. No wonder the best posters like Da Schneib don't hang around. I may have to crap-can this entire website. This is absurd. Oh dear! What an idiot! "Lasted this long"? They are looking back to 13.8 Ga! Why some of these idiots feel the need to comment on things that are waaaaay beyond them is a mystery to me. Apparently, you haven't been reading Da Schniebo's hundreds of nasty and disgusting comments in hundreds of other physorg phorums. If you had, your intelligence would have been sorely offended and your opinion of Da Schniebo would have drastically changed for the worst. Stick around and you might get to read his offensive, abusive and scamming comments, unless he realises that you are present and cleans up his act to impress you. @Castrogiovanni, there is little hope for this situation. We have a small percentage of people interested in real science against a tidal wave of disruptive fools and morons. The density of these idiots is higher than the stellar density of Omega Centauri. Perhaps we can get our own thread going inside this Idiot Background Noise (IBN). Probably best to press "ignore" on all the clearly obvious IBNs. That will make sifting through the comments easier. You might know something about this related issue - While the KB is well known with lots of big objects, particularly curious being the scattered disc, do you give much relevance to the notion of an Oort cloud extending out 1-2 lights years. Seems a tad far for such small object to be gravitationally bound for so long so far out there. Where is Da Schneib when we need him?! The flattirepillock russianbot & the sillyegghead saudubot, spring into action to provide evidence for ny speculation. Thanks boys! Glad your programmers weren't passed out as usual. Who knew? tTey would listen to my suggestion for them to sober up? At least on the job at the black web sites. @theredpill, everything around us has "been around" for 13.8 billion years (recent galaxies seen at 13.7, I believe). The CMB can last that long because it is like everything that came from the bang. Everything we can see, and are made of has lasted that long too. It is not "physically impossible to have lasted this long". It certainly has! Any other notion is insane as it would not fit the overwhelming data. The expansion of the universe is continuously red shifting the CMB, which will always be with us, and continue to redshift it into the future. The latest on the expansion is that it too is on a grand scale, where galaxy clusters are contracting, but these clusters are all receding from other clusters. Massive voids fill most of the universe. You should spend some time reading up on real science, because it has always been, is currently, and will always be the best show in town. They all have to pay their caretakers to type their gibberish into the computer for them. Those welfare checks they get every month are a nice bonus for the underpaid caretakers! I'm trying, trying real hard! To think of the minimal salary I'd insist for taking care of any of these looneyticks. "There's going to have to be a few more zeroes to the left pf the decimal." So...anybody know what those two flashing *Stars* are in the video? Variables? Something else? And Ultima kinda looks like a spiral...a Space Plankton feeding on Thule! Light up the engines! Get some space between us and them! These are merely different representations of the same data; it's not a difference in the measurement. Two different definitions of spectral radiance peak from the same measured data. I agree the article isn't written all that well. Gravity acts over long times and long distances; this is because there is no antigravity to oppose it on galactic and galactic cluster scales. Unlike the electromagnetic force which comes in positive and negative forms. I blush. Thanks for your compliment. These are variables, and the time between frames is constant but the period is extremely exaggerated as seen in the following 40 seconds where we travel all the way to Ultima Thule. The rates seen for each are the common denominators between the frequency of each variable and the time between each frame. The rates could even overlap where the left flash appears to rest, but the magnitude of the right flash may cause it to be lost due to the way the image is read or processed for contrast. Da Schneib, thought it was trivial, Could not figure it out from that article. Blushing should not be in your persona. And it wasn't meant as a compliment, but rather as a cry in the wilderness among all the trolls! You tell things in a rational, measured way, stuff the anti-trolls want to hear. Hell, let it go to your head - swell up proud as a peacock as long as you hang around! I tend to get arrogant at times due to my long years among the same kind in my research area. Defensive mech. The Kuiper Belt and Oort Cloud are farther apart than Earth and Jupiter. The main evidence for the Oort Cloud is from long-period comets, and the fact we don't see long-period asteroids. Many of the "comets" we see are actually mixed ice and rock. Most of the known asteroids are inside the KB. Long period "asteroids" would be much harder to detect since they would not leave an ejecta signature. We have not been looking long enough to know everything that is long period. We have only begun to locate all the NEOs and are in fact behind on this. So you do not deny that long period comets could actually be KBOs that have simply survived for extended periods with many trips to the inner solar system, each time getting a velocity boost? It certainly seems like a viable alternative. Hale-Boop is about 25 miles in diameter and has a period of about 2,500 y. It could as easily come from the known KB than a theoretical distant "cloud". I have an intense need for emperical data. Perhaps a character flaw. Anybody thinking about deflecting incoming impactors better hope it is not a long period object. You will only have a few months to do anything about it. Agreed, plus it makes some degree of sense that there are some lingering small objects out there left over from the solar system's formation. My personal problem with the Oort Cloud is it almost invariably described as "pristine," as if it had not changed from the beginning. We are just beginning to come to grips with all the objects that passed close to our solar system over the eons. For example, the two dwarf stars that comprise Scholz's Star must have passed through the Oort Cloud 70,000 years ago like a drill bit. The red dwarf part is 86 Jupiter masses and the brown dwarf part is 65 Jupiter masses. There must have been many more close passes over the eons. A good hypothesis is testable, so if I am right about all the close celestial passes, the Oort Cloud may still exist but it will be much more modified than previously believed. I would expect to find objects exposed to high temperatures, objects with different isotopic signatures that originated in other solar systems, and a wide variety of objects in wildly different orbits all inconsistent with being "pristine." Another reason for the lack of long period asteroids could simply be that of destructive encounters. Re-reading a bit on the Oort cloud, long period comets start at 200 years and go out to the thousands. As a comet out-gases, many appear to reveal a inner rocky core "similar to asteroids", as I just read. Now how do you tell these apart? Albedo? Spectra? Sooner or later, most if not all of these "LPOs" will either be ejected from the solar system or be destroyed like at Jupiter, earth, etc. I will have to guess that these objects' trajectories have a lot to do about indicating their origin. Give you 5:1 odds that Da Schneib has an answer for this one. Welcome to the chat Mark. We can always use some sane people who actually deal with the subject at hand. My interpretation exactly. We have a 200 million year orbit of the galaxy with (maybe) a 30 million year "wave-form" in that orbit. That last number is based on the period of major mass extinctions on earth, I believe. Just remembered that the largest objects in the KB are actually dwarf planets, many in the "scattered disc", in highly inclined orbits off the main KB. Pluto is the most famous of them. This scattered disc should also be populated with tons of smaller KBOs, which could also rain down into the solar system. Moving around with those dwarf planets could perturb them more readily than their near-static ecliptic orbit around the sun. This could blow away any trajectory notions suggesting an Oort cloud, etc, further out. Big question: Are most comets coming at us along the ecliptic, or from anywhere in the sky? After all, a large part of the Oort cloud is considered to be spherically distributed around the solar system. If most long period comets are coming in along (or near) the ecliptic, you can kiss some of that Oort cloud good-bye. If any are coming from way off the ecliptic, then we have some evidence for more distant sources. These are variables, and the time between frames is constant but the period is extremely exaggerated as seen in the following 40 seconds where we travel all the way to Ultima Thule. I sat down in front of the t.v. 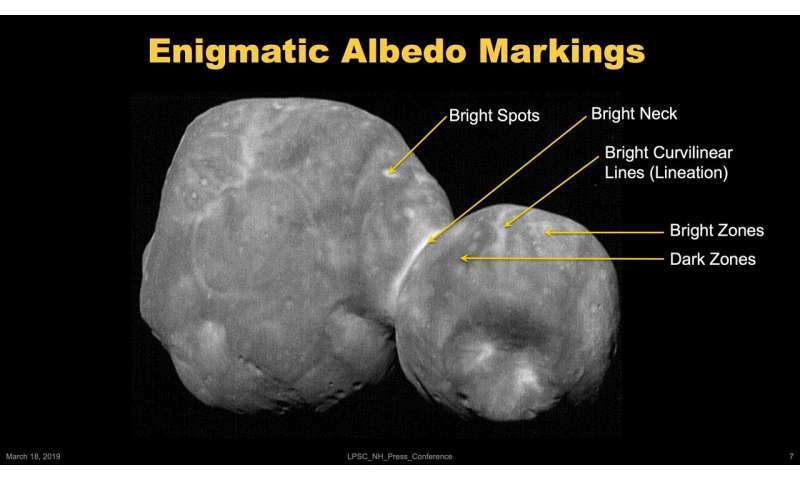 after work and it occurred to me since this AWESOME video zoom into Ultima Thule was composed of "all" the images captured...the blinky stars may well be representative of the ground acquired occultation data critical to the successful targeting of the mission. If so, an acknowledgement! This cries out for a return mission! "A star is expected to pass through the Oort Cloud every 100,000 years or so." If this is accurate, it seems as though the cloud would be largely dispersed by now. How could such a "cloud" still exist? Even if this is off by an order of magnitude, like once every one million years, so many close encounters with massive objects closer to the cloud than our sun surely would have scattered it far and wide, so to speak. Can anyone say if Ultima and Thule were rotating in the same or in opposing directions prior to joining (coming to rest)? In the same plane? In the plane of their co-orbit? Prograde or retrograde? They now appear to be spinning slowly clockwise viewed from NH trajectory in the above video, but the lumpy "circumference" along Ultima's visible edge appears (to me anyway) to sport a couple of crescent shaped slip-planes just at the "neck" joining with Thule. Did Thule shove up a bit of a mound as it settled into place? Did it roll into place, or "bounce" a few times along the "equator" of Ultima, before gently nestling in for the duration? Turn the car around and go back! OK - I think Ultima was rotating clockwise with it's equatorial rim approximately coplanar with the plane of the orbit with Thule. Thule was rotating counter-clockwise relative to Ultima's rotation, but with it's axis of rotation approximately parallel to Ultimas. When the two kissed for the final time, Thule dug in, and it's remaining rotational energy was cancelled by some (much?) of Ultima's rotational energy. Thule "bit" into Ultima (rather than bouncing off), shoving a wedge of material backwards against Ultima's direction of rotation and then stalled in place. Perhaps Thule was even "flash frozen" into position by impact melted ices? (Bright Neck?). Looking forward to more from the New Horizons team! I might accept, if enough proof is collected. That there are some stars born in the same stellar nursery as Sol, might retain a cohesion of orbits. That after tens of billions of years still retain that loose cluster attraction? In addition to randomly coursing one-time fly-byes. It seems most of the stars talked about for such improbable fly-byes. Are smaller than Sol? Most seem to be low-temp red dwarfs & infrared Brown Dwarfs. Neither type would have been any more visible to an Earth observer than Neptune or Uranus. Anything of Super-giant sized planet or even a small star that approached as far in as the Kruiper Belt would have scrambled the outer system a lot worse then we are seeing. Instead of the small fly-byes swiping very many outer shell snowballs. I think it is a lot more likely Big, Bully Sol stripped the small stars of their snowballs. no matter how often or how regular. Were far enough apart to cause no more disruption than exchanging a few snowballs. With Sol taking the lion's share. I am opinionating, that eventually when our tech is sophisticated enough, that we will discover that such massive planets are a rarity among the outer systems of Sol Mass stars . I am speculating that a Saturn or larger gas giant will be the norm for outer system worlds the same approx distance from it's primary. Beyond will usually be primitive rocky-ice worlds. Consider that the unusual mass of both Uranus & Neptune. I suspect both worlds have occured Thela-type collisions. Both from protoplanets like Triton ejected from the Inner Solar System. Smaller rockyice worlds wandering the outer planetesmal disk. 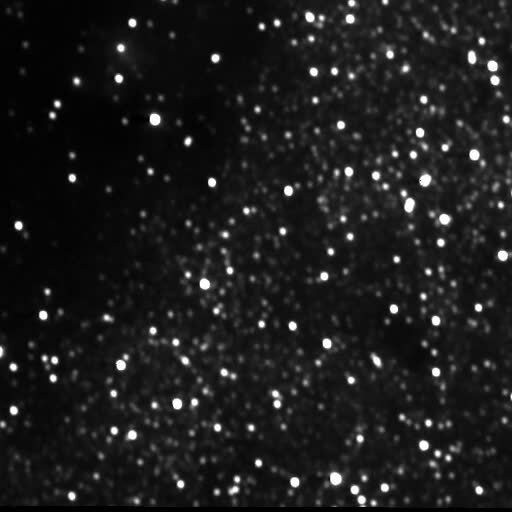 & capturing Interstellar bodies that passed too close. rrwillsj, calculations based on stellar density in our neighborhood, and in the general vicinity of our orbit of the galaxy suggest many close encounters. Our orbit has a period of about 250 millions years. It appears to have made a pass by a red dwarf 70,000 years ago. Some postulate the Oort cloud extends out to 3 light years. Close to the nearest star system - Alpha Centauri (AC) at only 4.7 light years. The two primaries have a mass twice our sun. This would put much of the Oort cloud closer to AC. Difficult to believe those small icy bodies closer to another star system are going to retain a cohesive "cloud" with AC tugging at them for a very long time, to say nothing of a star plunging through the Oort cloud itself. Additionally, many stars have formed since our's did and some of them almost directly in our path. NOT passing close to other stars is less likely than passing close to them. It is purely a matter of stellar density, directional vectors and time.
" There are 52 stellar systems beyond our own Solar System that currently lie within 5.0 parsecs (16.3 light-years) of the Sun. Depending on mass plus, distance, each one's "local duration" (and time of formation), their presence alone should represent a combined gravity much more likely to disrupt the cloud rather than sustain it. 52 stellar systems must be at least 20X solar masses, and probably a lot more. Consider these stars and brown dwarfs (BWs) - been hanging around for some billions of years, one can envision where a star or BW passing near or in the Oort Cloud (OC) would disrupt it enough that some is pulled away from the sun's grasp, like the gas giants which clear our area of interlopers. Anybody have a guess on what the immediate asymmetric mass within that 5.0 parsecs, and effect on small bodies in OC over long haul, + intermittent stellar fly-bys? Appears I might be the last holdout on this one. Hope not. W = 7 km/s (northwards out of the plane of the Galaxy)""
We are currently plowing through space well off the ecliptic at good speed. Make no mistake. Over 4 billion years+, numerous close-enough encounters with other stars moving in whatever direction could have easily disrupted a vastly extended Oort cloud. thanks dfj for the info drop. Especially the Cornell material. Which I have not seen before. If mot available online? I understand & thank you for what you were able to provide. I still hold the opinion that people are expecting too much of these fly-byes. One of Gravity's constants is the Inverse Square Rule. The further from _ A _ Mass, the less Attractant effect. I speculate that past the Kruiper Belt, out into the Oort Cloud. Will mostly be found are snowballs. Scientists have expressed the hope that these will be pristine samples, surviving from the formation of our Solar System. I suspect there will be found a wild assortment of snowballs collected over the last few billion years. From the Oort Clouds of passing Star Systems. & which in turn carried away snowballs from Sol. Except for the unpredictable outcomes of collisions? I expect we will see some exotic ice sculptures & maybe even large gossamer snowflakes? google "direction of solar system in orion arm" and you will find some interesting things about where our solar system is going. We are not simply on a merry-go-round in our orbit of the galaxy. It's dangerous out there! And snow flakes for an Oort cloud seems more than likely. But they would be very dirty from all the cosmic radiation, etc. over time. Just think of what countless intense gamma ray bursts would do to it over billions of years. thanks dfj,I';ll check out the kinks you provided. I do not foresee much useful scientific data to be gained from either the Kruiper Belt or Oort Cloud. Except of course for those researchers specializing in those objects such as comet hunters. I think the important discoveries will be figuring out the whys? of all the anomalies of Neptune & Uranus & their satellites. It is very amusing to contemplate the infantile mental processes of misogynists. Who will be imagining far-off Alien Astronomers peering at the Solar System through their telescopes. & seeing the outer shell of our Oort Cloud as wispy pink. The femme haters little brains would explode! dfjohnsonphd, I just had a chance to get back to this thread and appreciated your comments. Thanks for carrying on without me. I think all the close passes over the eons virtually guarantees whatever remains of the Oort Cloud will not be "pristine." I might agree that much of the original Oort cloud is dissipated except it can't be completely dissipated because we still have the original evidence of long period comets. However, we probably picked up some hitchhikers over the eons from other solar systems. Unsurprisingly, I see rrwillsj is still somewhat skeptical. If you look at the close passes both in the past and in the future, there must be a continuous parade of objects going by the solar system at least on the million year scale. For example, Gliese 710 is supposed to pass only 0.178 ly away in 1.28 million years. This is where we part company. I think there is something to learn around every corner, in all parts of the solar system, with every new object. There is the potential for a vast amount of knowledge to be gained. Considering the scale of the universe, this knowledge could be incredibly important and help us to understand our place in the universe. Perhaps this is the difference between us because I KNOW we need to get out there. I know it in my brains and I feel it my bones. If the world felt like I do, crewed spacecraft would already be exploring the outer solar system and we would be enjoying the benefits. I realize that eventually even utterly strange objects will ultimately become familiar. Heck, maybe once you have seen a million comets you have seen them all. But are only at the beginning right now. It is all new to us.